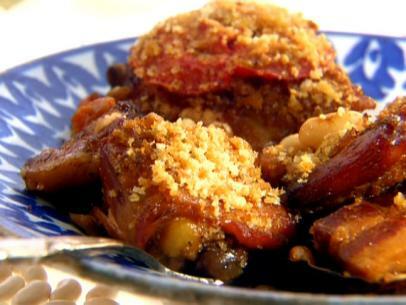 Cassoulet is a typical French Country dish. This recipe is great because it can be made fairly quickly, it’s very delicious and quite impressive to serve! Preheat the oven to 350° F. Rinse and dry the chicken well and season with salt and pepper. Let sit at room temperature for 15 minutes. In a large Dutch oven, over medium-low heat, add the bacon and slowly render the fat. Remove the bacon to a plate when crispy, leaving the fat in the pan. Raise the heat to medium-high and add the chicken, skin side down. Brown the chicken on both sides and then remove to a plate. Add the onion, celery, carrots and garlic and saute until soft, about 45 minutes. Deglaze the pan with white wine and reduce by half. Stir in the beans, bay leaf and thyme. Nestle the chicken thighs and bacon into the pot. Add the chicken stock, cover and bake in the oven for 20 minutes. 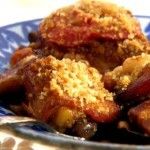 Remove from the oven, remove the lid and top the cassoulet with sliced tomatoes and the Garlic Bread Crumbs. Return to the oven and bake, uncovered, 15 minutes longer. Serve the cassoulet with baguette slices. In a small saute pan over low heat, add the oil and the garlic. Stir until the oil is fragrant, about 1 minute. Toss in the bread crumbs and cook until the bread crumbs start to turn golden, about 2 to 3 minutes. Season with salt and pepper, to taste, and remove from heat.